This case study was originally published as part of a series of downloadable Essential Guides, written by Tony Orme, Technology Editor of The Broadcast Bridge, supported by Riedel. AMP VISUAL TV, one of Europe’s largest providers of OB vehicles for remote video productions, has adopted Riedel’s MediorNet real-time signal network and Artist digital matrix intercom for its Millenium Signature 12 and new Millenium 6 OB vans. MediorNet and Artist combine to provide a comprehensive signal transport and communications backbone for these groundbreaking vehicles, both of which greatly expand AMP VISUAL TV’s 4K and HDR production capabilities. The MediorNet network delivers several core benefits to MS12 and Millenium 6 including integrated components that work together seamlessly, flexible and modular system design, and an innovative approach to signal distribution and routing. At a base level, this offers greater efficiency through simpler configurations, an enormous reduction in cabling, and the ability to create flexible interiors in the vans. Even more, with similar Riedel systems installed in both MS12 and Millenium 6, as well as in their fly packs and IXI DSNG vans, members of the production team can easily shift from one van to the other and interconnect those fly packs and DSNG vans as production requirements demand. As a specialist in live television coverage, AMP VISUAL TV provides services that cover all aspects of the production process for live programs and those produced under live conditions. The company operates one of the Europe’s most extensive fleets of OB vans for on-location events and has nearly 40 studios at its disposal in and around Paris, France. With more than 500 employees and 30 years of experience in television production, AMP VISUAL TV has always undertaken to guide its clients through the technological developments that drive and shape broadcasting. Today, the AMP VISUAL TV crew offers expertise in every aspect of production and a commitment to results that exceed client expectations. The core of AMP VISUAL TV’s mobile OB fleet is its Millenium family of extendible semi-trailers, anchored by the state-of-the-art Millenium Signature 12 (MS12) HD/4K-capable OB van. With the ability to support productions of up to 40 cameras, MS12 features a modular design and a mobile partitioning system. 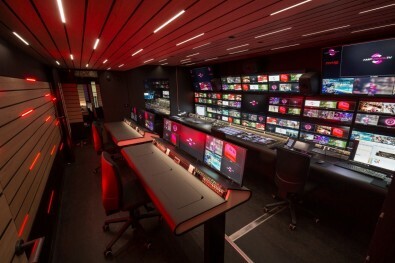 This enables it to be transformed into a two-in-one OB truck capable of conducting joint operations with two independent production areas, two audio mixers, two vision rooms, and up to 42 modular workspaces. MS12 was launched in 2016, just in time for coverage of the 24 Hours of Le Mans. Other recent projects include Euro 2016 football in UHD, Europe League matches and final, the 2016 U.S. presidential elections, and the 2018 winter games in South Korea. For its new Millenium 6 OB van, AMP VISUAL TV envisioned a 100 percent flexible and reliable networked signal infrastructure that could remain future-proof, especially as broadcasters continue to explore fully IP-based operations. Millenium 6 would be an all-new 4K HDR OB van boasting an unprecedented combination of technology, aesthetics, and ergonomic features designed to give production teams maximum power in minimum space. Designed to handle most major productions, Millenium 6 also would feature a modular design and a mobile partitioning system adapted from MS12 to enable flexible workspaces. To meet these requirements, AMP VISUAL TV partnered with Riedel Communications once again to design and deploy a communications and signal transport backbone based on Riedel’s Artist digital matrix intercoms and MediorNet real-time media network. MediorNet meets AMP VISUAL TV’s requirements by delivering the performance customers demand and the flexibility they need to address the challenges of broadcasting in 4K, both now and in the future. Millenium 6 features a robust and decentralized MediorNet signal network that can support up to 26 wired and wireless cameras, a multiviewer monitor wall, and Riedel’s Artist (wired) and Bolero (wireless) intercom systems when fully implemented with a fly pack. Millenium 6 is equipped with four MetroN core routers, 24 MicroN high-density signal interfaces, and two MediorNet Compact Pro stage boxes. In addition, a Riedel Artist intercom matrix rides on the MediorNet network, together with assorted control panels, commentary panels, and Performer digital partyline beltpacks. MediorNet’s decentralized router concept is quite unique and represents a complete departure from the traditional monolithic routers found on many of today’s OB vans. Typically, a van is designed around its router because the router takes up a significant amount of space and places large demands on power and cooling. Every signal in the van must pass through the router so cables run from the router to every I/O device on the van. This can amount to a lot of cable. The MediorNet approach puts the four MetroN core routers at the “center” of the van with MicroN devices placed wherever signals are required, connected to the MetroN with singlemode optical fibers. This approach significantly reduces cabling, simplifies the overall configuration, distributes risk by eliminating the router as a single point of failure, and opens up the interior of the van for the creation of flexible workspaces. With no large router, cooling requirements are reduced and less cable means more room in cable trays and, theoretically, less overall weight. One advantage of centralized routers is that they are completely non-blocking, which means that every signal is available at every location in the van. While this approach is very convenient, it can be a very inefficient use of available bandwidth. MediorNet cannot efficiently create a 100 percent non-blocking signal backbone, but a little bit of planning makes this a non-issue. Never, in practice, will every position need access to every signal. By determining a maximum signal count for each location, designers can implement a system that will handle 99 percent of the situations that Millenium 6 is likely to encounter. Should it ever become necessary to accommodate that last 1 percent, operators can use the MediorWorks software interface to quickly make the appropriate changes. Each MediorNet Compact and MicroN feature on-board signal-processing capabilities including frame synchronization, embedding/de-embedding, and delays. The MediorNet Compact units provide a complete array of audio, video, and data I/O while the MicroNs include 12 SD/HD/3G-SDI I/O, two MADI optical digital audio ports, a Gigabit Ethernet port, two sync reference I/Os, and eight 10Gb MediorNet high-speed links. The MediorNet MicroNs are software-enabled hardware that can perform different duties through the use of Apps. Currently, five different Apps are available including standard, point-to-point, MultiViewer, IP gateway, and a new Processing App for color correction and UDX conversion. License switching allows clients to change Apps easily. Working seamlessly with the MediorNet MetroN core router, which provides the heart of the network architecture, the MicroN devices give AMP VISUAL TV a high degree of flexibility in addressing the current and future demands of video production. MediorNet Compact Pro frames serve as stage boxes and provide AMP VISUAL TV with additional signal interfaces for the field. Signals includes analog audio inputs and outputs (including mic pre-amps), Ethernet tunnels for various uses, MADI for multichannel audio, and HDMI video signals – all seamlessly integrated into the MediorNet signal fabric. In addition, the MicroN devices support Millenium’s modular approach with the ability to be strategically placed close to signal sources and destinations, making it easy for AMP VISUAL TV to tailor signal routing to the demands of individual productions, whether large or small, while reducing cabling and system complexity. Fewer cables mean less weight, more space in cable trays, and reduced aircon requirements. Without the need to build around a large centralized router, AMP VISUAL TV is enjoying much greater workspace flexibility. Another efficiency created by decentralizing the router and placing I/O where it’s needed is full redundancy of all video and audio signals for commentary, intercom, and signal distribution, critical elements of any live production. Finally, the modularity of the MetroN interfaces, which allow Millenium 6 to link easily to the MS12 HD/4K van or to a shared fly pack for producing shows of all sizes, has been a huge convenience. Rather than over-investing in gear, AMP VISUAL TV is able to tailor the infrastructure to production requirements. MediorNet resources can be allocated to several productions at once or assembled together to support a single large event. You are requesting access to this sponsored content as '' (0). Submitting this download request indicates that you accept that your details and your responses to the survey below to be shared with the content sponsor.